It's no secret; I'm a fan of the American TV series 'Mad Men' and the reasons are predictable. Yes the show is historically authentic, the cast stellar and the story lines depressingly realistic but what really tickles my fancy is ... can you guess? The clothes! It is becoming more and more apparent that I need to wear a bib when watching this show; the drooling gets out of control. It's getting harder for me to hold on to the plot when these gorgeous clothing creations come swinging their hour glass hips onto the TV screen. Oh Joanie, you complete me. My immediate thought when I see these dresses, and I know I'm not alone, is 'I must have this!' And then I sit there scheming and dreaming until I calm myself down with a plan of how I can re-create the look. My latest (and not my last) copy-cat fever took over my senses recently with the charming black and white gingham dress that is worn by the lovely character Peggy Olson. There are so many things that turn me on about this dress. 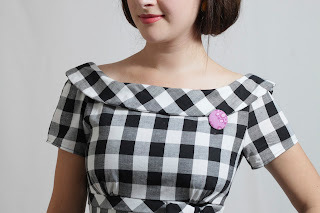 The high empire waist, the curved collar, the cute little bias strip under the bust line and the incredibly satisfying placements of the black and white check. This dress screams vintage. I busily got to work drafting my own version of this dress. 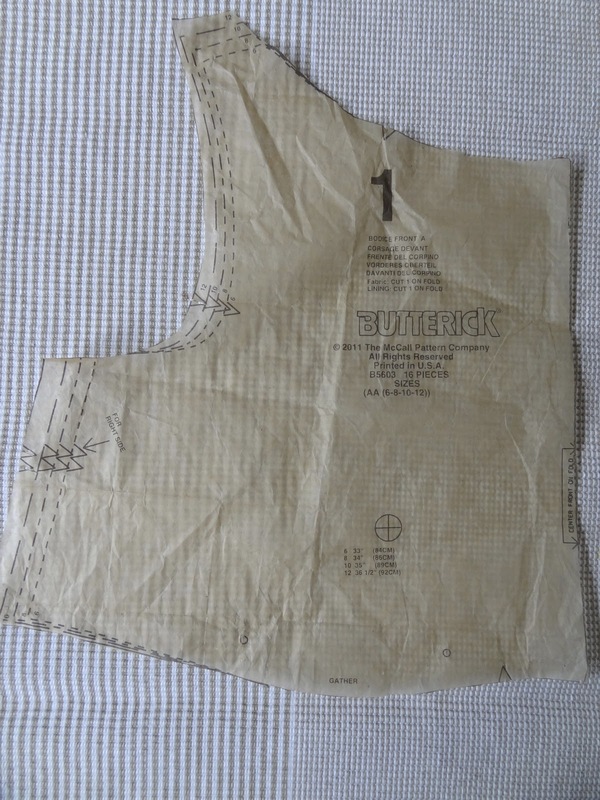 For the bodice I used the wonderfully cut Butterick pattern 5603. 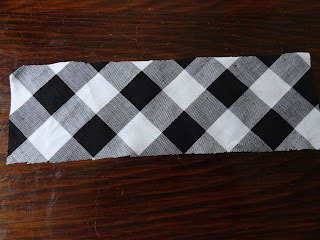 This pattern has three versions. I used version A, the yellow dress in the centre. Can you see the similarities? It has a wide bateau neck and empire waist line that sits right under the bust. It also has the bias strip under the bust line with a bow. 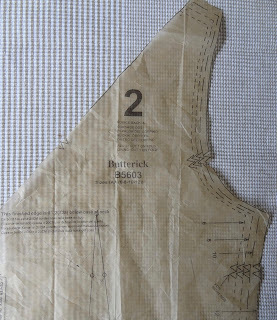 The pattern is a great one for butterick. I found the fit very flattering with a really nice neck line. I removed about 1 cm from the length of the bust piece to account for my short torso. And no I haven't cut my hair off! For these photos I tucked my hair under to make it look like a bob. How vintage of me! I drafted my own collar front and back. 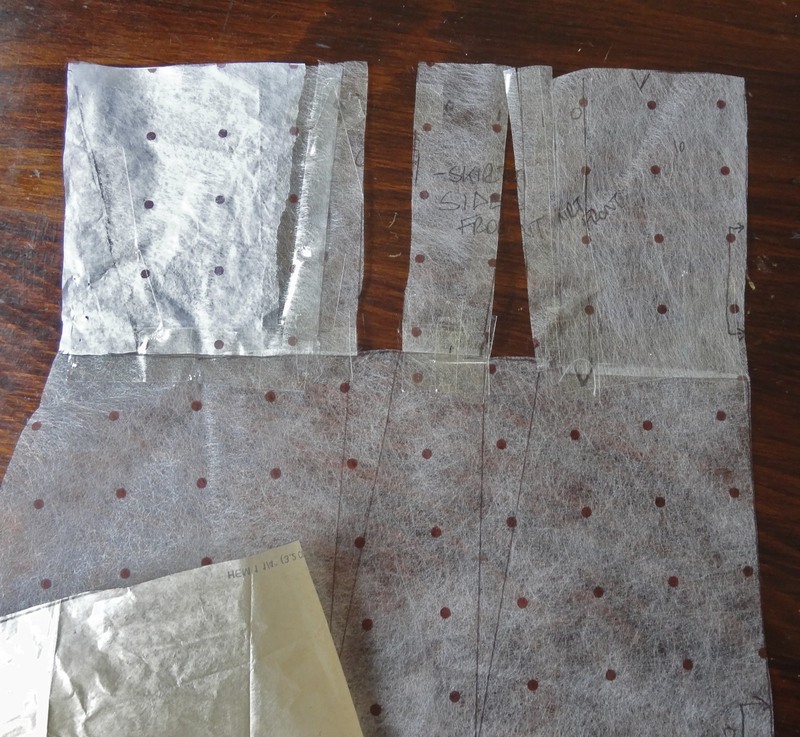 To do this I used some tracing paper and the original pattern pieces. 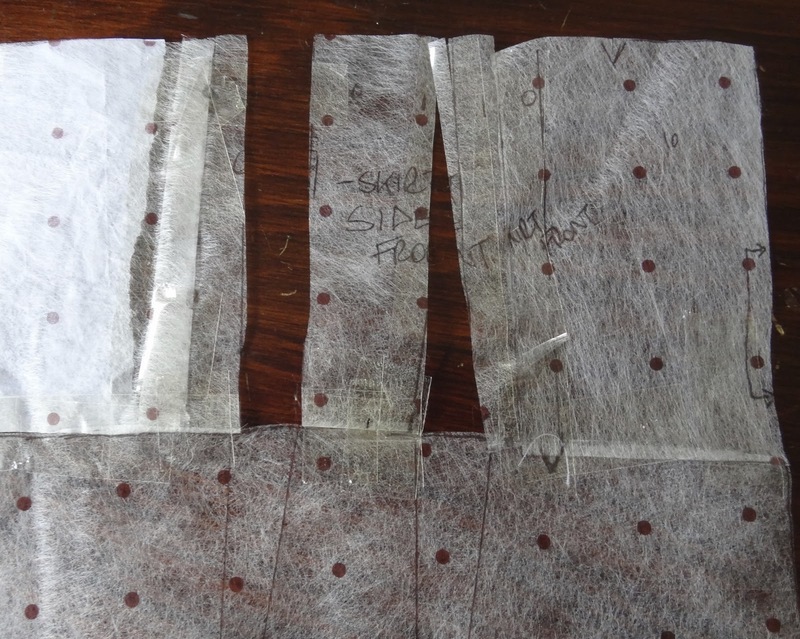 I lay down the original pattern pieces on a table and and pinned a sheet of tracing paper ontop. 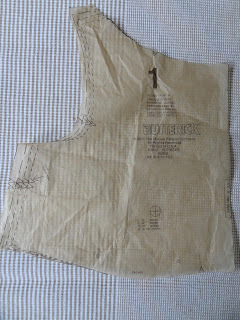 I then traced the shape of the neckline and shoulders onto the paper. 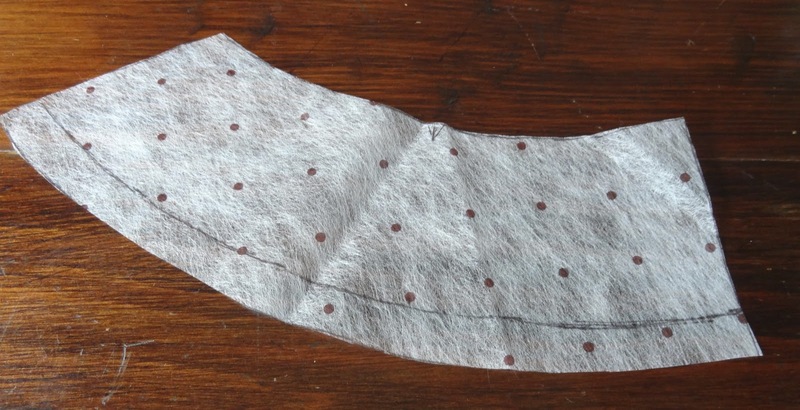 Once I decided how wide I wanted my collar to be, I measure that distance down from the centre seam and shoulders, added a seam allowance, and cut it out. And now I had my collar pieces which I cut on the bias. 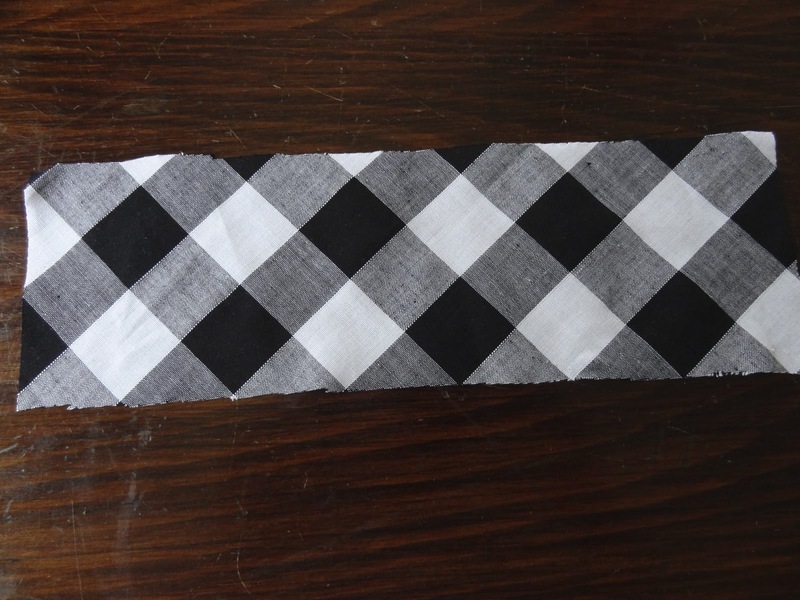 To create the pencil skirt look I used a skirt pattern that I had previously drafted that I knew worked for me. The midriff section and the skirt of this pattern is joined together in one piece so that there is not a seam at the waist which I love. This was exactly what I was looking for as the Peggy Olson dress also doesn't have a seam at the waist. 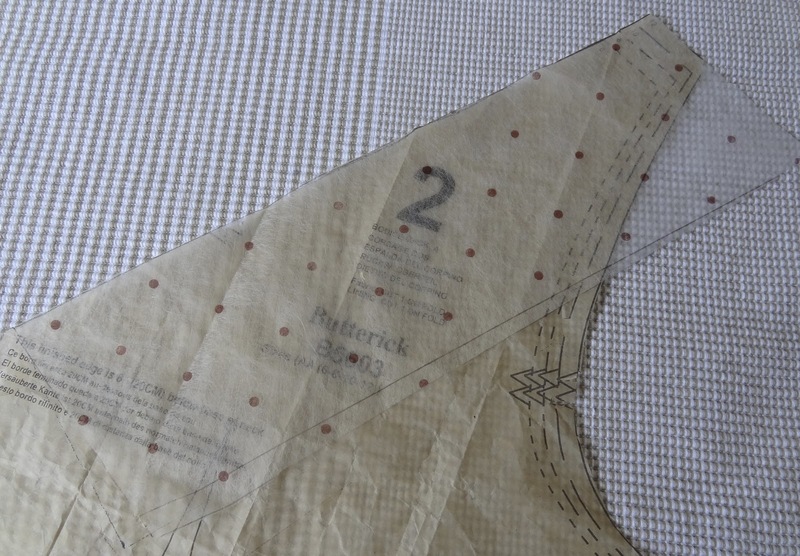 The problem with this Butterick pattern is that the dart placements on the midriff section did not match the dart placement on my own pencil skirt pattern, and I wasn't willing to move the darts on my skirt as I knew they were in the right spot for my pear shape. So instead I tried the challenge of changing the midriff section. 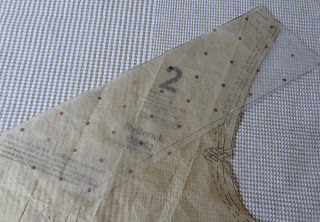 I carefully traced the midriff section onto tracing paper from the waist point upwards. I then closed all the darts and seams. I also had to add seam allowances to the centre back as I wanted the zipper to be placed down the centre back instead of on the side seam like the Butterick pattern. Starting at the side seams, I then lined up the midriff pieces onto the waist of my skirt pattern. At the first dart on the skirt I slashed a line right through the midriff piece and then started the rest of the piece on the other side of the dart. Now I had created a new dart in the midriff piece that perfectly lined up with the dart in the skirt piece. I continued this on for the front skirt pieces as well. Can you see how I've cut the midriff sections as I've come to one of the skirt darts and then started it again at the end of the dart? The picture above is the front skirt which has two darts. The gaps in the midriff piece from where I've cut and stuck on either side of the skirt darts will now become the new midriff darts. Now everything lines up! 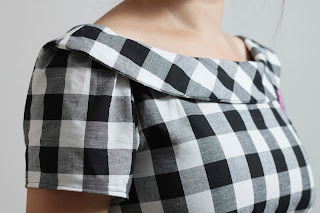 Cutting out the fabric pieces when you're using a gingham print is a lot more time consuming than cutting out fabric in a block colour or a randomly placed print. When cutting out this type of print it is very important to get all the squares matching up or things start to look wrong and messy. A bit more effort is required but it's not hard and readers it's totally worth it! Instead of folding your fabric in half and cutting the pattern piece out in double, you need to lay out the whole sheet of fabric right side up and individually cut each piece out. 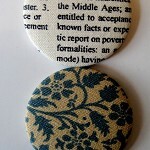 Above is an example of a piece that I cut out individually but that I need two of. 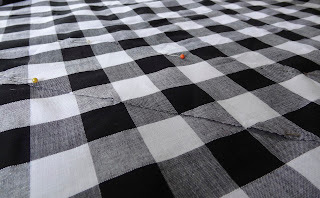 Once I had cut my first piece I flipped it over and place it on the laid out fabric (right side to right side). It's important to turn the piece over so you get two mirrored pieces instead of two identical pieces. 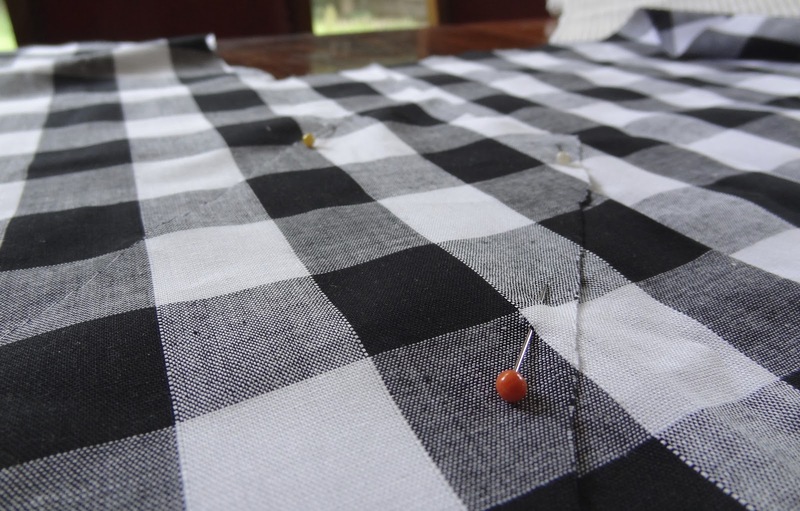 Here you pin it to the fabric so that the squares are exactly matched. This should mean that it blends in perfectly with the background and is camoflaged. You almost can't see it! Once you have perfectly lined it up and pinned it in place, using the top fabric piece as your pattern piece, carefully cut the second pattern piece out and then add your notches and markings. The result is you now have two mirrored pieces that are exactly matching each other. 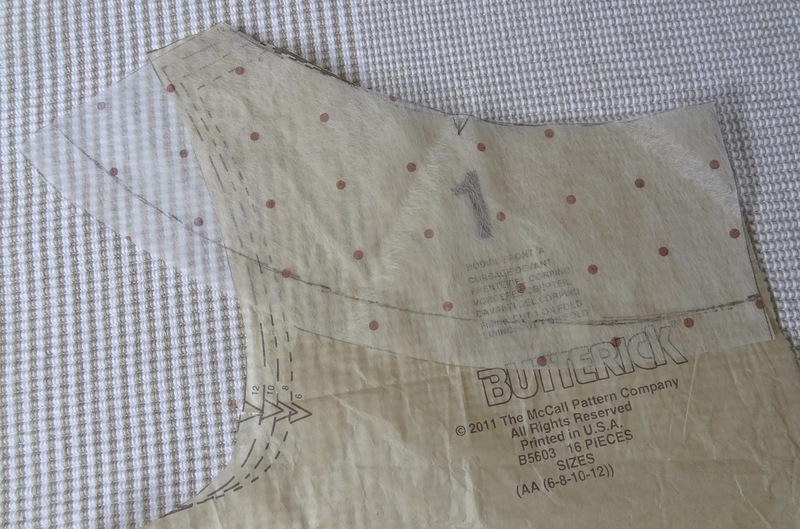 I also made sure that the centre front and back line of the bodice and skirt started in the same place. You'll see on my dress I've chosen the black/grey squares as my centre and it flows all the way through the dress. 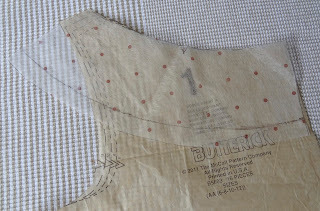 I also cut the collar on this bias to give the nice contrast. I made the extra effort to make sure that even on the bias the black square was placed on the centre front. 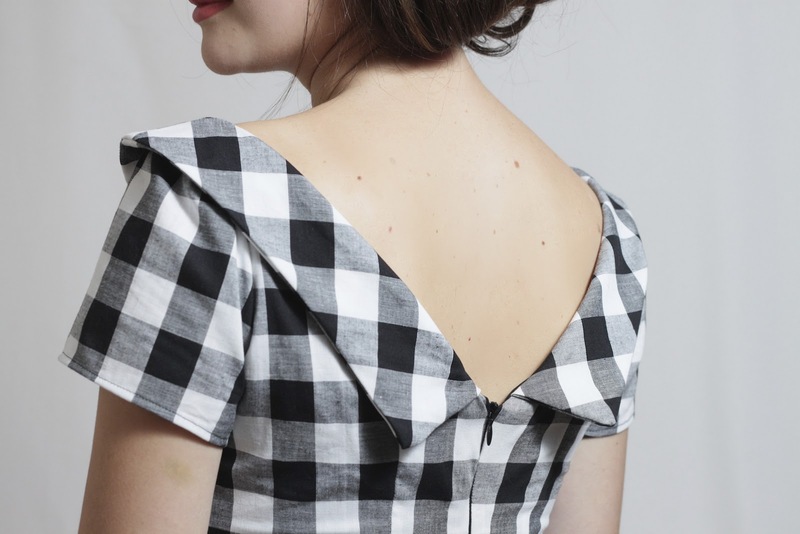 I love the dipped V shape back, especially with the wide collar. My husband says it looks classy. Bless. I drafted my own sleeves but made them shorter than Peggy's version. The butterick pattern also included pattern pieces for a bow (bonus!) so I cut one out on the bias, but instead of placing it in the centre of the band under the bust, I placed it to the side just like Peggy's version. How cute are bows! Seriously! It adds such a sweetness to a dress, and I love the band under the bust which I've also cut on the bias. Look at those squares all lined up! I used an invisible zipper down the centre back instead of a button closure at the front like the inspiration piece. Don't get me wrong, I do love the buttons, but I felt a bit nervous using a different type of closure in an area that can so easily become unflattering on my pear shaped lower half. Maybe next time. 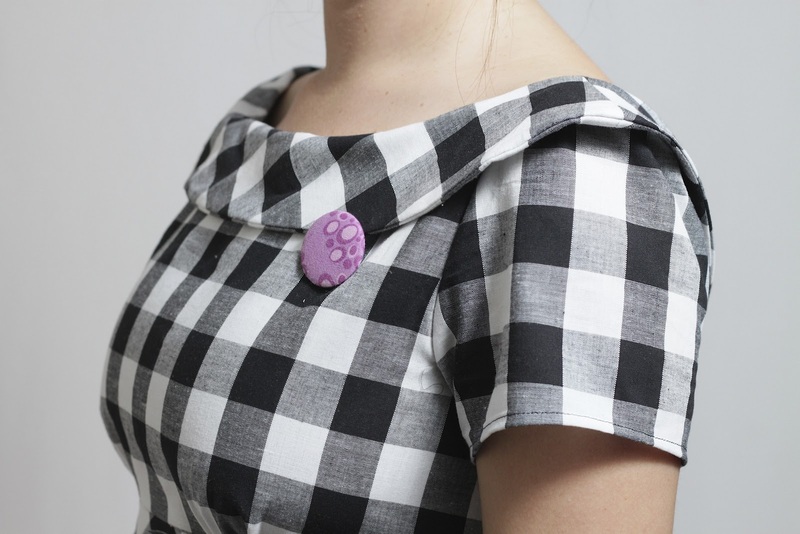 I think this dress has enough going on with it however that the look is not compromised with the loss of the buttons. Yes, I like my photos served with cheese. I love the vintage of this dress and how prim and proper I feel when I wear it! I wore it out to dinner the other night and I had lots of older ladies give me warm smiles when they saw what I was wearing. I always take it as the highest compliment when an older woman exclaims 'Oh that's what I used to wear when I was young like you!' Big warm fuzzies! Hi, I have been to your blog a few times over the last few weeks and have yet to comment. I love everything you have made and this one is fantastic! Your styling is great and so are your photos! Gorgeous! I can't get enough of your blog. 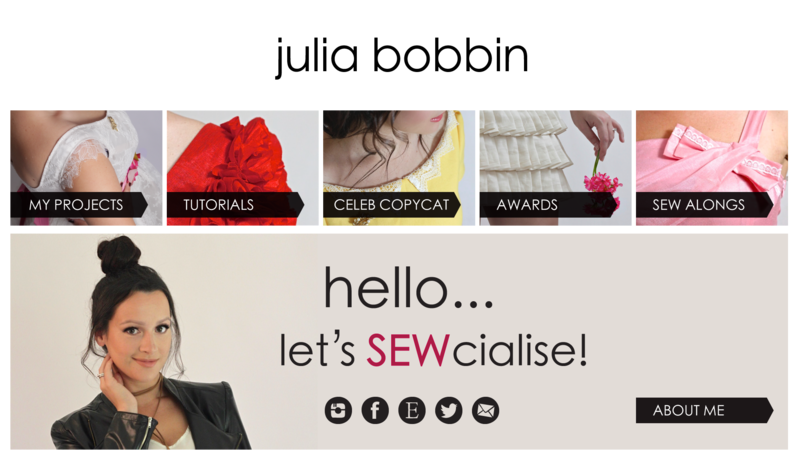 You do it all so darn well: the sewing, the writing and the photos. Oh wow. I just love this dress so much. I loved it when I first saw it on Peggy (but shh - I think I love your version even more)! Absolutely gorgeous, the collar is stunning. I'm nowhere near good enough to start splicing patterns etc - I'll just watch with envy! Wow. Wow. WOW! Your dress is fantastic! Seriously it is one of the best dresses I have ever seen on anyone's blog. Better than the inspiration dress! Gorgeous! You did a great job reproducing that dress and it's so flattering on your curves! I must ask: where did you get those beautiful shoes? Absolutely love the dress just up my street. Julia, you are so talented! I love reading your blogs, your creations are always beautiful. Love the dress!! What a perfect dress! Well done. 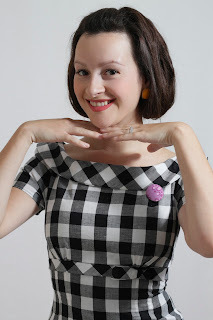 you're my mad men sewing hero! the dress is spot on! Fantastic success! I'm totally storing that collar drafting idea for later use. 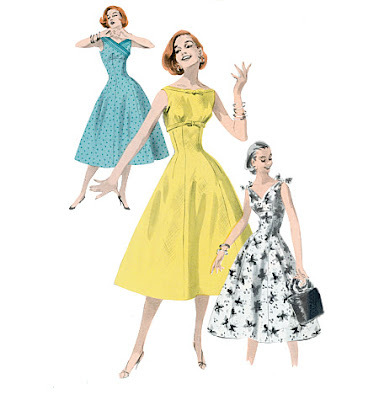 I GUSH over the costume designs in MadMen! Your inspired dress is beautiful! I especially enjoy the bias cut collar! Also, your photos are wonderful! This dress is just gorgeous. I just watched the episode she wears that dress in a few days ago, and totally fell in love. When I'm a little more sure about my fitting skills, I'm totally copying you, so I want to thank you in advance for the lovely photos documenting how you did this! 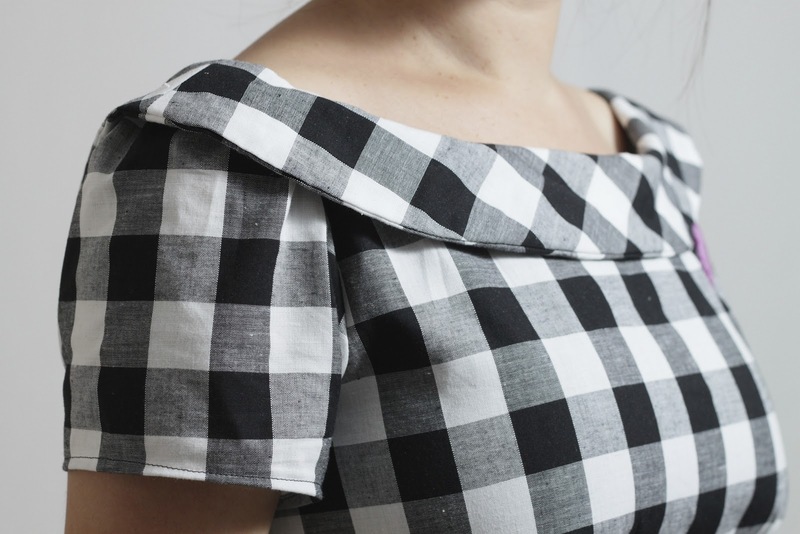 Beautiful and well done on the gingham! Gorgeous dress! 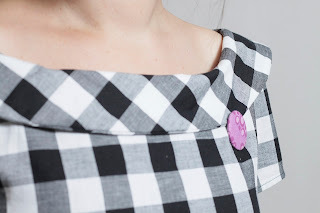 My last (and first) plaid dress was really hard to do with all the matching, and yours looks so great! And the collar is fantastic. This is phenomenal. How do you manage to churn out such gorgeous creations at such lightening speed? You are so inventive. Very Peggy indeed!! You look awesome and fantastic creation, as usual! LOVE IT!!! This dress looks amazing on you. 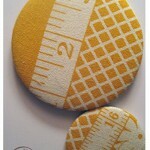 Especially rewarding when you've altered patterns and changed things to suit. Question: Is that vilene with dots? 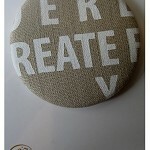 I use vilene when I copy garments - would love to buy some like yours - thanks. Oh my GOD - I can't believe you made Peggy's dress!!!! I have been lusting after this dress forever. Your version is simply stunning. LOVE. IT. This dress is amazing. The best thing is what it does with our womenly curves. So cool! Stunning dress! You are very talented and photogenic too. Your photos are eye candy just like Mad Men. @Melizza That is the best compliment a girl could get! Thank you! @Meigan Oh my goodness Meigan! What a compliment! Thank you so much for reading! @Evelyne Thanks Evelyne! It's 'Kwik Trace' 100% nylon pattern tracing cloth by Kwik Sew www.kwiksew.com I actually got it from a friend and it's great! It doesn't tear and it's translucent! Thanks Julia - googling as I type!!! Somehow your blog dropped off my blogroll. Weird. Anyway, fabulous dress! And fabulous job drafting all the elements that went into it. I am in awe. 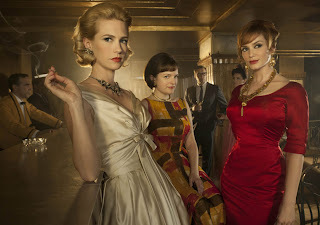 I agree about the drooling when watching this show and wonder how many ladies were really that put together back then? Is that actually a reality? Thanks Amanda, that's a great compliment coming from some one as skilled as you! I agree with you on the 'is that actually a reality'. I'm sure back in the early sixties not everyone was as well dressed and as beautiful as the women on the show. But I love it any way! Just found your blog, and I love what you've done with this dress! 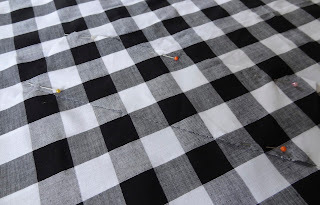 Plaid/checks can be so frustrating to work with, but you make it look simple. Thanks for the cutting tips. My goodness thanks JD! It feels like I'm talking to my self when I say 'JD' cause that's what everyone calls me at work!! Hi Jane, I'm stoked that you love the Peggy dress as much as I do! The moment I saw this dress on Mad Men I fell instantly in love. I am very pleased with how my version turned out and I highly recommend you make one yourself! It's the sort of dress that makes you feel all lady-like and it's so different to what other people are wearing out-and-about. I am in love. As soon as I have a waist again, I shall be following your lead. It is so beautiful. I came to your blog from Jane's blog, and I'm glad I did. Oh my goodness! This dress is totally dreamy. 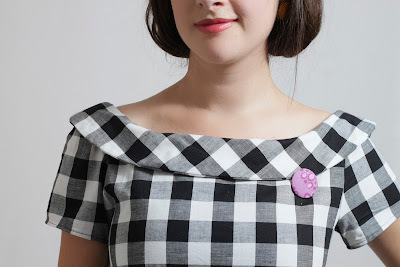 I've been planning to make up the pattern for this dress for a good few months but have been too intimidated to start. Seeing how much work you put into it makes me feel even more intimidated! But sooo inspired at the same time. It is absolutely GORGEOUS!! Just found your blog through Handmade Jane, by the way. Looking forward to seeing more of the lovely things you make. Tilly that is such a great compliment coming from you! I just checked out your blog and I am now your newest follower! It looks great! Definitely inspired me to make a version based on that pattern. Oh yay I'm glad to hear it! Looking forward to seeing what you come up with! Such an impressive effort and such meticulous attention to detail. I am in awe! It looks beautiful and you will be able to treasure it for a long time. Thanks Carita for your kind words I really appreciate it! I am very pleased with how it turned out and hopefully I'll get a lot of wear out of it. wow i just find your blog and I like it! 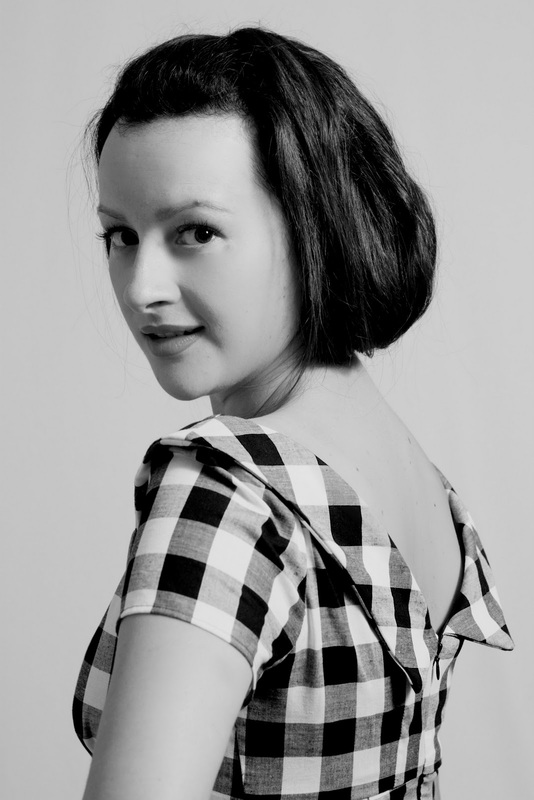 its vintage and its about Mad men ( closets) like like like :) dress is great! I love this dress, your version is beautiful. My version of this dress is also ready to be published. permission to use a picture or a link. Would you be interested in making one of those dresses for my wife? If so, how much would you ask, and what measurements would you need? Wow what a dress! And you are wonderful in it! This dress is the cutest!! A little more complicated than I'm skilled for as a new seamstress, but this gives me inspiration to try something more challenging! You've got a perfect figure and the dress looks amazing on you -very authentic. How did you draft the skirt bit? This is awesome, love your blog. Would you be willing to make another? Ever since I saw it I knew I had to own this dress, and I've never sewn a thing in my life. Maybe a button... Please let me know if you have a shop or would be willing to make me one. Email me at Kennedythomas11611@gmail.com if you would :) thank you so much! I LOVE your dress! I like yours better than the one of Peggy!!!!!!!!! I don't like all that buttons, and the bow down on the dress.